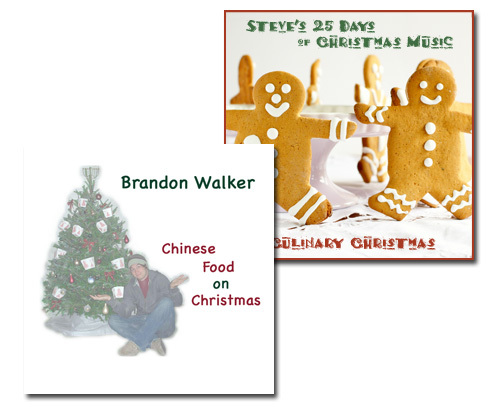 So, let's say to decide to have a Steve's 25 Days of Christmas Music theme around food. Just how would you go about finding such music? At first I did a search of my existing Christmas music library (all 18GB of it) for songs with obvious references to food in their titles. But that only gets you so far. So eventually you start searching the Web with phrases like "Christmas food songs" and the like. Searches like that brought me to today's song, Chinese Food on Christmas. This song was written in 2004 by a fella named Brandon Walker, who authored it for a songwriting class at James Madison University. In 2006, he recorded himself playing the song on piano and uploaded it to YouTube (Watch here). It turned into a pretty popular video, generated hundreds of thousands of views. The following year, he put together a professionally shot music video and again stuck that on YouTube (Click to view). This is what really put him over the top, as the song now has 1.7 million views. And that's the version that we're featuring today on the 25 Days. But nowhere on there was me. I'd have no place to go. Fun song!! Our family had to eat at a Chinese restaurant on Christmas one year (we're not Jewish) and it has become a favorite memory! !